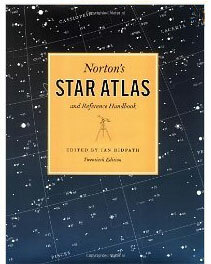 Generations of amateur astronomers have called it simply Norton's: the most famous star atlas in the world. Now in a superbly redesigned, two-color landmark 20th edition, the first of a new century, this combination star atlas and reference work has no match in the field. First published in 1910, coinciding with the first of two appearances by Halley's Comet during the book's life, Norton's owes much of its legendary success to its unique maps, arranged in slices known as gores, each covering approximately one-fifth of the sky. Every star visible to the naked eye under the clearest skies—down to magnitude 6.5—is charted along with star clusters, nebulae and galaxies. Extensive tables of data on interesting objects for observation accompany each of the precision drawn maps. Preceding the maps is the unique and authoritative reference handbook covering timekeeping and positional measurements on the celestial sphere; the Sun, Moon and other bodies of the Solar System; telescopes and other equipment for observing and imaging the sky; and stars, nebulae and galaxies. Throughout, succinct fundamental principles and practical tips guide the reader into the night sky. The appendices Units and Notation, Astronomical Constants, Symbols and Abbreviations, and Useful Addresses complete what has long been the only essential reference for the stargazer. Now presented more accessibly than ever before, the text and tables of the 20th edition have been revised and updated to take account of the new and exciting developments in our observation of the cosmos. The redesignedstar maps offer outstanding legibility, in the living room or under a red light in the dark outdoors. Presented with an authority that has stood for generations, Norton's Star Atlas and Reference Handbook remains the indispensable companion for all who gaze at the night sky. For use with your first pair of binoculars, in choosing your first telescope, and as a trustworthy companion no matter how far your interest takes you, this elegant edition launches Norton's into a new century as the classic reference in astronomy. "Once in a blue moon a book appears to dramatically and forever change its subject; in short, the work becomes an indispensable resource for generations. Norton's Star Atlas is such a work." "The new edition of Norton's Star Atlas should be a real winner: once again, the amateur astronomer's indispensable companion."